Latter-day Saints, Mormons, like many other religious people, wear special clothing with religious meaning. Often Christian ministers and priests wear special robes or collars to identify themselves. In secular society, police officers, basketball players, or nurses wears special clothing to identify themselves with a particular group. Such clothing provides a sense of belonging and a personal reminder of what membership in that group entails. When we see Protestant clergy or Buddhist priests, we automatically recognize a deep sense of religious commitment on their part. When we see a Catholic nun wearing the traditional black and white habit, we may identify her with people like Mother Teresa, who helped the poor and needy. Jews wear a special garment called a Tallit Qatan (small Tallit), a four-cornered cloth with fringes. Based on biblical instructions (see Numbers 15:37-41), many Orthodox men wear this garment. It looks like a small poncho with four fringes attached (Tsitsit), and is worn beneath their outer clothing reminding them that the Lord has called them to be “a holy nation” (Exodus 19:6). Additional significance of this particular garment is debated among Jewish scholars. However, it is worn by Jews who believe the Lord has asked them to do so. Like some Orthodox Jews, Latter-day Saints wear religious clothing to remind them of their commitment to the Lord. The Latter-day Saint (Mormon) underclothing is called the holy garment, or more formally, “the garment of the holy priesthood.” In an age of political correctness and concern about respecting others’ religious beliefs, it is important to note that members of the Mormon Church do not use the term “Mormon underwear.” They prefer the term “holy garment” because for them the garment is more than underwear; it is a physical reminder to be faithful to the Lord. Much as a couple wears rings to remind them of promises made to each other, the garment reminds Latter-day Saints of their promises made to the Lord. use and care. They do not purposely display them publicly but attempt to be circumspect in removing them in public places such as gyms or locker rooms. Garments are white, symbolic of purity, and composed of two pieces that can easily be worn under modest clothing. Basically, the holy garment is worn night and day, except when a particular activity requires its removal, such as bathing, swimming, and certain other physical activities. Latter-day Saint (Mormon) soldiers wear a special holy garment that has been dyed so it will not draw attention in battle. There is nothing special about the material or the garment itself once it has worn out. Hate groups who know the Latter-day Saint sensibilities and practice often display garments publicly in a mocking fashion or refer to them as Mormon underwear. They do so to marginalize Latter-day Saints by making them appear strange, but they wound the feelings of those who wear the holy garment as a reminder of their faith. Such hate groups dehumanize others by making a mockery of their beliefs. In this age of religious pluralism, we would never think of mocking a Jew for wearing a Tallit Qatan or display the garment in a mocking way, referring to it in inappropriate or offensive ways. 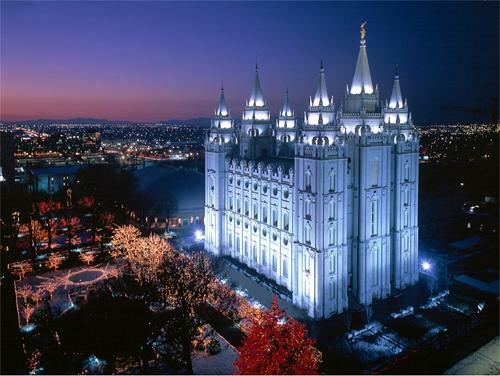 Latter-day Saints ask for the same religious sensibilities to apply to them as with all religious groups.